More than just a BUZZ word. EVERYONE is becoming more and more Health conscious. Our healthy vending range is growing on a regular basis. Want to have a healthy vending machine in your place of business, school or office? Here at Gecko Vending, we are incorporating healthy and nutritious snacks and drinks into our healthy vending machines in Brisbane. The customer demand for healthy vending machines in their workplace is growing rapidly. By improving the vending machine in the workplace to be part of Healthy Choices programs, many Brisbane businesses and companies are embracing the healthy vending machine revolution and asking Gecko Vending to be their preferred supplier. 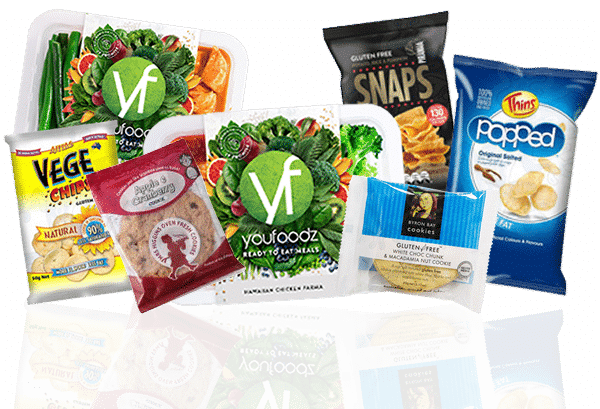 Examples of new healthy products recently added into our healthy vending machines in Brisbane include Gluten Free Chips, Popcorn and Go Natural Bars. Fresh healthy product options include reduced fat cheese & crackers and low fat yoghurts. Our healthy drink options include sugar free, low calorie and drinks sweetened with Stevia. Some popular healthy gym snack options are fruit and nut trail mixes, 97% slim bars and low sugar protein bars. By choosing to have a healthy vending machine, you are sending a clear message to your employees that you are promoting a healthier workplace for the well being of all involved. Brisbane is leading the way in healthy vending machine options and Gecko Vending is proud to be a leader in this field. Why is having “Healthy Vending Machines” the hottest trend right now? Have you ever noticed that most people are talking about or know someone who has talked about Healthy Vending Machines in recent times? Is this just a trend or more of a long term shift in thinking for the new-world workplaces? Many businesses are now offering wider workplace policies and strategies focussing on the health and wellbeing of their employees. Some healthy workplace activities include walking meetings, healthy lifestyle information sessions, health check-ups and active lunchtime sporting events. The workplace vending machine is also coming in for a revamp, a rebranding if you like. The Healthy Vending Machine is now focussing on products that are low calorie, low fat, gluten free and low sugar. Not all the vending machine drink and snack favourites are history though. Employees are still adults and able to make their own informed decisions about healthy choices. So that means the cold can of coke drink, packet of salty chip snacks or mid-afternoon chocolate bar will still be there, probably just moved to a lesser visibility spot in the vending machine. It has been said that just by swapping one vending snack or drink per week will have a measurable effect on your health and wellbeing including increased concentration, higher energy levels and improved efficiency at work. Gecko Vending Healthy Vending Machines are taking the lead! We realise the importance of healthy product availability in our Healthy Vending Machines. In some cases, vending machines can be the sole source of food and drink options to workplaces or worksites. These sites can work long hours or have access to dining options limited due to cafeteria locations or opening hours. Now that vending machines are more readily accepted and are located at more accessible locations within workplaces and public places, they are becoming available to be used by a wider array of adults and children alike. This also infers that vending machines of now indirectly contributing to an ever growing proportion of each person’s daily energy intake. Nutrition guidelines as published by Australian Healthy Food Guide indicate that the daily energy intake for the average adult is 8700kJ. Each person’s individual dietary requirements may be higher or lower depending on age, gender, height, weight and physical activity levels. So now, more than ever, providing healthy vending machines containing healthy drink, healthy snack and healthy food vending choices is a responsibility that Gecko Vending takes seriously. We are committed to providing healthy vending choices in a way that is not complicated or confusing. We are always researching, trialling and sourcing new product lines to add to already exhaustive healthy products selections. Access to healthy product choices in the vending machines must be convenient while still living our busy lives. If your current workplace or public place vending machine does not meet your expectations in regards to the inclusion of healthy choices in the drink, snack and food product options, then you should consider asking Gecko Vending for a FREE appraisal to see how we can improve your workplace vending machine and provide a tailored Healthy Vending Machine solution for you.